It's been a busy few days, and some big thanks are in order! First, to everyone I met at the London Film & Comic Con – the organisers, the brilliant Waterstones booksellers, and all the lovely people who came and bought advance copies of Phoenix – thank you! It was a special day for me, because it was the first time I saw an actual copy of Phoenix, so thanks to everyone who's been part of that journey... 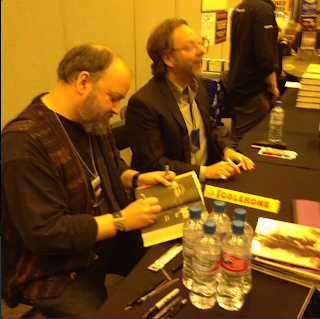 Here's a picture of Dave & I signing; and no, that Toblerone bar didn't last very long! And today I had the great pleasure of visiting Taxal and Fernilee Primary School, where I met some awesome Varjak Paw fans, some fantastic young readers & writers, and some brilliant teachers! 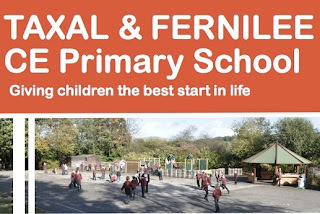 It was wonderful to hear all your stories, thoughts, and enthusiasm for books; I hope you'll all keep on reading and writing... And if you want to see the Phoenix book trailer I mentioned, click this link, or have a look at the next post down in this blog!